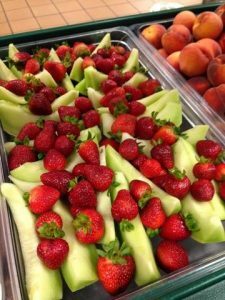 Trailside’s Fruit and Veggie bar is featuring locally grown Utah Peaches from Petersen Farms, along with gorgeous strawberries and fresh melons! Beautiful presentation Trailside Lunch Ladies! Fresh fruits and vegetables are served daily to our children with their school lunch. EATS and the Park City School District are working to bring in more local foods.